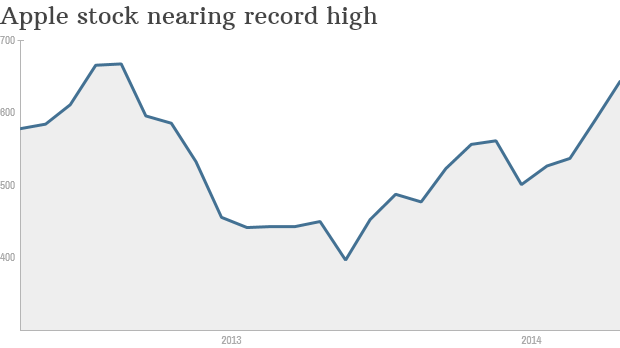 Apple stock: How high can it go? Click here for more information about Apple's stock. The home of Apple's headquarters might as well be called Supertino these days instead of Cupertino, at least in the eyes of Wall Street. 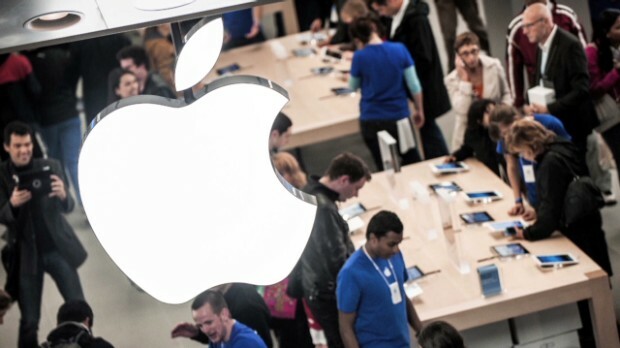 Apple (AAPL, Fortune 500) stock traded as high as $644 a share on Friday, the top price in more than a year and half. And if Goldman Sachs (GS, Fortune 500) is correct, this is just the beginning of the rally. The investment bank raised its price target for Apple to $720 on Friday, well above its prior prediction of $635. UBS, among others, also upgraded the stock this week. Anything above $700 is significant. Apple's stock closed at a record high of $702 in September 2012, and plenty of people have questioned whether the company would ever be anywhere near that again. There's a lot of momentum driving this "golden Apple" resurgence. The company is fresh off its blockbuster Beats acquisition and will host its Worldwide Developers Conference next week, where it has traditionally unveiled fresh products such as a new iOS platform or device. Goldman is betting that Apple will reveal new software soon. In an era when everyone has a smartphone or a tablet, cool software is what differentiates a company from its competition. While iPhone sales are still robust, the iPad hasn't had the same spark. Rumors of what's coming next week from Apple range from a health tracker to more ways to for people to connect their home devices to their phones and apps, the next evolution in the so-called "Internet of things". "We expect upcoming hardware refreshes to act as powerful near-term drivers of earnings momentum and stock performance, but platform enhancements such as mobile payments, connected home solutions, and personal health monitors should be far more important," the report said. The company also announced a 7-for-1 stock split at the end of April. It's mostly a practical and psychological move. It doesn't create new value for the company, although it will make buying a share of the tech giant a lot less expensive for normal people. At current price levels, a share of Apple would cost under $100 after the split. Related: What does 7 Apples a day mean? Investors have responded positively to the move, sending the stock up nearly 17% since the announcement at the end of April. Market indexes are shown in real time, except for the DJIA, which is delayed by two minutes. All times are ET. Disclaimer Morningstar: © 2014 Morningstar, Inc. All Rights Reserved. Disclaimer The Dow Jones IndexesSM are proprietary to and distributed by Dow Jones & Company, Inc. and have been licensed for use. All content of the Dow Jones IndexesSM © 2014 is proprietary to Dow Jones & Company, Inc. Chicago Mercantile Association. The market data is the property of Chicago Mercantile Exchange Inc. and its licensors. All rights reserved. FactSet Research Systems Inc. 2014. All rights reserved. Most stock quote data provided by BATS.